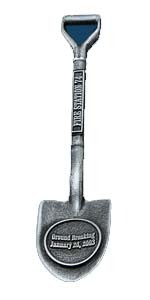 Mini Metal Shovel.Use for your next ground breaking event. Folding Gift Box / 15 lbs lbs / 100 pcs. 14 Business Days *Production time begins after artwork approval and does not include shipping time. Imprint Area: 7/8" x 3/4"